Trend Micro HijackThis is a free utility that generates an in depth report of registry and file settings from your computer. Trend Micro HijackThis makes no separation between safe and unsafe settings in its scan results giving you the ability to selectively remove items from your machine. In addition to this scan and remove capability Trend Micro HijackThis comes with several tools useful in manually removing malware from a computer. Trend Micro HijackThis helps you find and fix unwanted computer settings. ...... Do not make any changes to your computer settings unless you are an expert computer user. Advanced users can use Trend Micro HijackThis to remove unwanted settings or files. To analyze your computer, start Trend Micro HijackThis and run a scan. See the Quick Start Guide [link to Quick Start, FAQs and Feedback] for help in running a scan. Trend Micro HijackThis will display a list of areas on your computer that might have been changed by spyware. Do not change any settings if you are unsure of what to do. There are many popular support forums on the web that provide free technical assistance by using Trend Micro HijackThis log files to diagnose an infected computer. It merges data from multiple versions of spreadsheets. 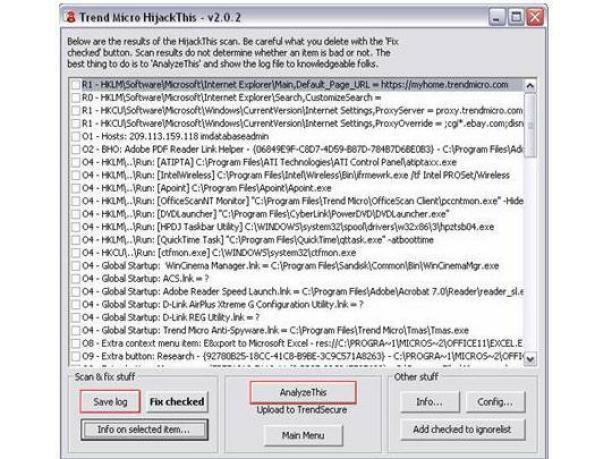 Qweas is providing links to Trend Micro HijackThis V2.0.2 as a courtesy, and makes no representations regarding Trend Micro HijackThis or any other applications or any information related thereto. Any questions, complaints or claims regarding this application Trend Micro HijackThis V2.0.2 must be directed to the appropriate software vendor. You may click the publisher link of Trend Micro HijackThis on the top of this page to get more details about the vendor.